C1576. BRUNO MADERNA Cond. 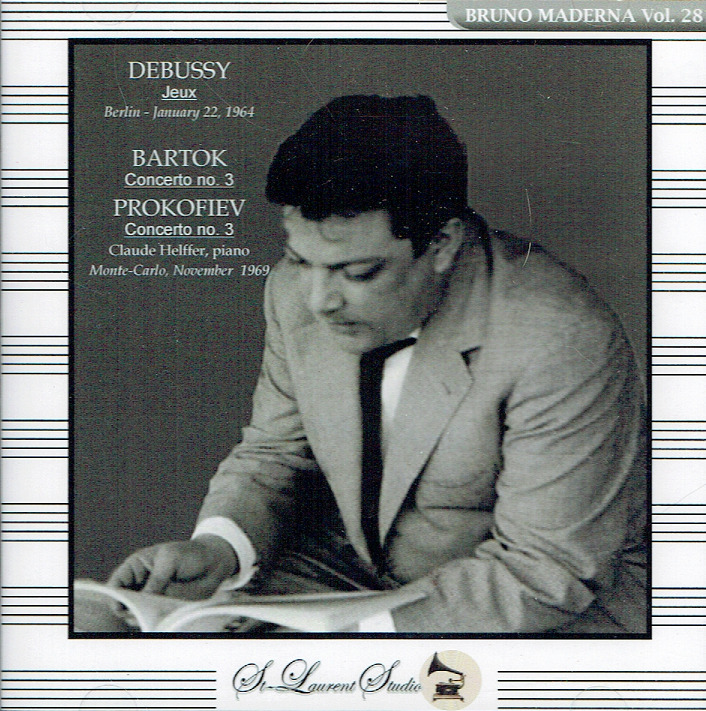 Deutsches S.O., Berlin: Jeux (Debussy), Live Performance, 22 Jan., 1964; Monte Carlo National Orch., Monaco, w. CLAUDE HELFFER: Piano Concerto #3 in E (Bartok); Piano Concerto #3 in C (Prokofiev), both recorded 1969. (Canada) St Laurent Studio YSL T-599. [A duly thrilling program offering a beguiling performance of 'Jeux', then coruscating performances of Bartok & Prokofiev - recorded in a spacious acoustic, all in stupendous sound!] Transfers by Yves St Laurent. "This internationally renowned French pianist specialized in contemporary music, but he also excelled in the performance of traditional repertoire by Mozart, Beethoven, and Schumann. Helffer began his piano studies at the tender age of five. The famous Robert Casadesus was impressed by his playing and took him on as a student. He studied harmony and counterpoint with René Leibowitz and gave his debut recital in Paris. In 1954, he became associated with the Domain Musical Orchestra and championed contemporary music. In 1962, he played for the first time in Latin America and made his American debut in 1966 with the Chicago Symphony. He debuted in Russia in 1968. 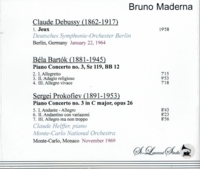 In 1978, he was engaged as a professeur d'interprétation at the Music School of Vienna. Helffer made his debut in Australia in 1980 and in Japan in 1984. He has continued to perform throughout the world with many well-known conductors, including Barshai, Boulez, Bour, Gielen, Iwaki, Maderna, Marriner, Martinon, van Otterloo, Pretre, Scherchen, Sebastian, and Tabachnik. Helffer also held master classes in piano music interpretation in Europe, North and South America, Australia, and Japan. He was a member of the editing committee on a critical edition of the works of Debussy for the Durand-Costallat publishing house, he presided over a revision of the composer's two books of preludes and the etudes, and published several volumes of pedagogical studies." 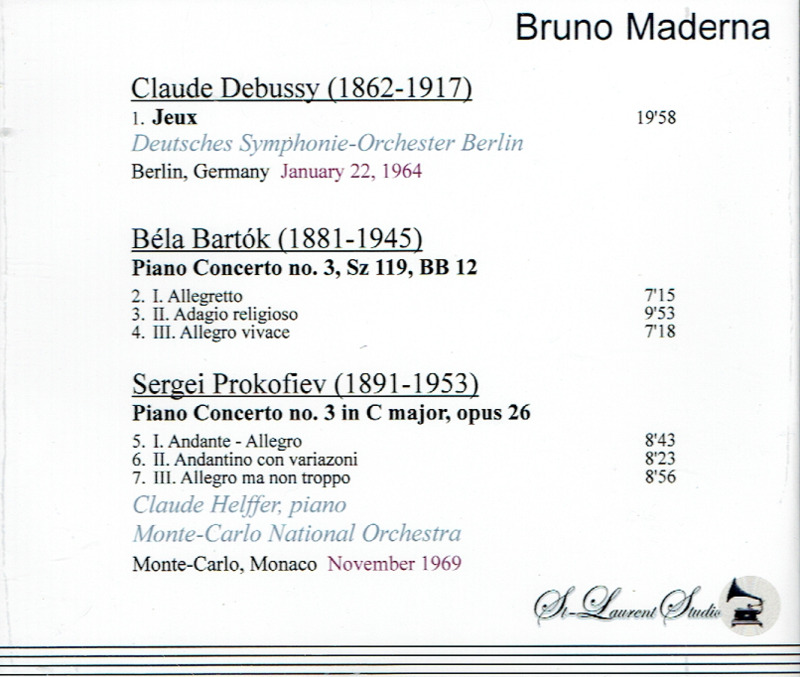 "Bruno Maderna, like his close friend and fellow avant garde composer Pierre Boulez, had in recent years become a conductor of international reputation. Since his debut here in 1970 conducting Mercadante's opera II GIURAMENTO at the Juilliard School, Mr. Maderna had led the New York Philharmonic, the Chicago Symphony, the Philadelphia Orchestra, the Boston Symphony and the Detroit Symphony. In Europe he had conducted widely, including the London Symphony, the B.B.C. Symphony and the Concertgebouw in Amsterdam. For the last two years of his life he was music director of the Italian Radio in Milan. Mr. Maderna did not put great stock in his, or anyone's, success on the podium. 'The era of the star conductor is finished', he told a NEW YORK TIMES interviewer in 1972. In place of that phenomenon we must have, he contended, composer-conductors who could guide the musical life of their communities. His ideal in this respect was Mr. Boulez, the New York Philharmonic's music director. Mr. Maderna, who was born in Venice, made his New York City Opera debut [in 1972] conducting a new production of DON GIOVANNI."